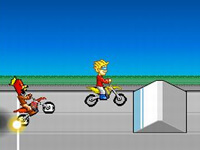 Description: In this game your aim is to get from point A to point B. In your ATV. However, you have to strategically drive your vehicle as you can easily flip over or fall off. So start your engine and hit the throttle. ATV Extreme is a Bike Games. Instructions: Arrow keys to ride your ATV..